Build a mission style hanging lamp for a dining room. 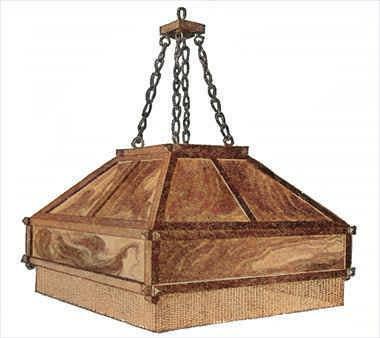 Click here for detailed mission hanging lamp plans. 4 pieces, 3/4 by 3/4 by 10-1/2 in., S-4-S, oak. 4 pieces, 3/8 by 3/4 by 23 in., S-4-S, oak. 8 pieces, 3/8 by 3/4 by 10 in., S-4-S, oak. 4 pieces, 3/8 by 3/4 by 9 in., S-4-S, oak. 1 piece, 3/4 by 8 by 8 in., S-4-S, oak. Begin work by shaping the ends of the longest pieces as shown in the drawing. All the angles are 45 deg. Next lay out the cross-lap joints at the corners so that two sets of horizontal frames shall be formed 23 by 23 in. Cut four pieces to a length of 3 in. each. Also shape up the "false" extensions of these pieces which are to be fastened below the lower frame at the corners. Since these are to be cut from the pieces just specified, the easiest way is to shape the end of each to the required angle and then crosscut. Rabbet these pieces sufficient to allow the art glass to set in on the back sides and be fastened—about 1/4 in. will do—and put them together with glue and brads. Now make the top square in a similar manner, except the rabbets. In this top square is to be fitted the 3/4-in. board which is to hold the lights and to which the chains are to be fastened. The sloping sides are next to be made. The sides are to be built up separately, the corners being lapped and glued after rabbeting the under arrises sufficient to let the glass in. The four sides are mitered together at their edges and reinforced by covering the joint with copper. These sides are next mitered to the top and bottom frames and made fast on the under sides with copper strips, glue being used on the edges of the wood. The shade shown had a mottled glass in which greens predominated. The sizes and shapes of these pieces of glass would better be determined after the woodwork is finished. One manner of fastening the chains is shown in the photograph. Such a combination will call for an extra piece of oak, 3/4 by 3-1/4 by 3-1/4 in. finished stock. A good finish for this shade is obtained as follows: Put on a coat of silver gray water stain. When this has dried, sand lightly with No. 00 sandpaper and apply a coat of golden oak oil stain. Allow this to dry after wiping the surplus off with a cloth. Put on a coat of black paste filler and allow to harden over night. When dry, sand lightly and put on a coat of very thin shellac. Sand this lightly when hard and put on a coat of wax. This is a very dark finish relieved by high lights of lighter brown and is known as Antwerp oak.